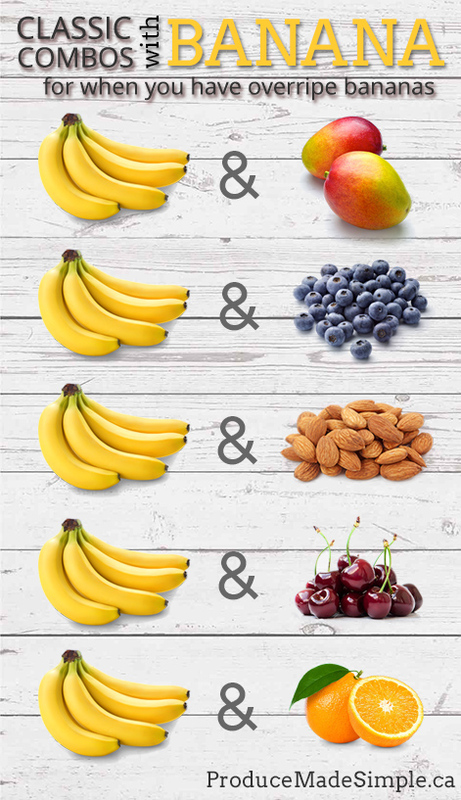 Everything You Need To Know About Bananas! The most common banana variety sold in Canada is the Cavendish banana, which are the ones everyone knows the most! 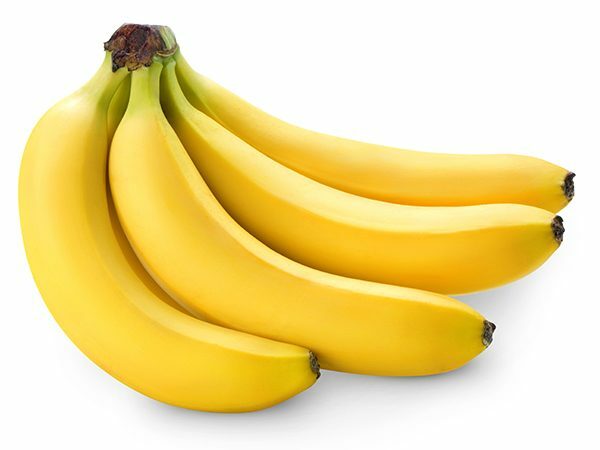 Cavendish bananas are yellow, with a slight bend to the fruit, varying from 6-8 inches in length. They are mellow, sweet, and creamy. There are also red bananas, about 4-6 inches in length, rather straight with a dark red peel. They taste sweet and creamy, with notes of raspberry. Baby, or Burro, bananas are a short, stubby variety of the bananas we all know and love. They’re sweeter and silkier than regular bananas, and lack the stringiness. When selecting bananas, it is important to think about when you’d like to eat them. If you would like to eat your bananas within a day or two, look for bananas that are yellow with no green or just a little green tint on the tips. 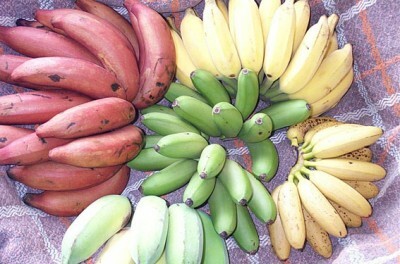 Look for banana bunches that are free of bruises or cuts, ensure that you look at the bottom of the bunch for bruises. Even if bananas are bruised, you can still eat them or freeze them for smoothies or baking. Store bananas on the counter, out of direct sunlight. To ripen faster, place them in an open, brown paper bag. The warmer the room, the faster the bananas will ripen. You can also add an apple to the brown paper bag to quicken the ripening process. To make them ripen slower, separate the bananas from the bunch. Green bananas will need a few days to ripen on the counter. 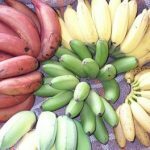 The ripening process for bananas involves starches converting into sugars, so it is best to avoid eating raw green bananas as the starches can be difficult to digest. Ripened bananas will have tiny dark specks, these dark specks help indicate how sweet the fruit will be. The more specks, the higher the sugar content of the banana. You can peel your bananas from either end, but peeling from the stem end may cause bruising at the top. Instead, peel from the bottom and enjoy! You can cut the bananas into coins, long slices, or diagonal slices. Cut bananas are best enjoyed immediately, as they may discolour after prolonged exposure to the air. These browned bananas are still safe to eat they just may not be as visually appealing. Everyone knows how to enjoy bananas fresh, but have you ever tried caramelizing bananas? Adding a bit of butter to a pan over medium heat and sprinkling some sliced bananas with brown sugar is a surefire way to make some yummy toppings for vanilla ice cream. Caramelizing bananas enhances the natural banana sweetness and softens bananas for a melt-in-your mouth texture. 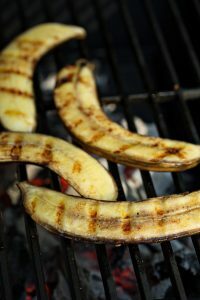 Grilling bananas is also a great idea! Brush on a light coating of melted butter and some brown sugar if you’d like (optional, of course) and put them directly on the grill until you see those coveted grill marks. Enjoy on their own, with ice cream, with some chocolate chips or even flaked coconut! Freezing bananas is a fantastic way of preserving over-ripened bananas for another day! There are a few ways you can freeze them. Peel and cut bananas into 1” pieces. Spread onto a baking sheet and flash freeze, and then transfer to a freezer-safe bag or container for later use. Peel and mash bananas, and store into a plastic bag, flattening for easy storage and space saving. When you want to use it, thaw and add to bread or pancake batter! Freeze bananas whole in the skin. To peel, use a sharp knife to cut off both ends of the frozen banana, then wedge beneath the skin to separate from the fruit. In all cases, use bananas within 6-8 months of freezing. The longer you let bananas ripen, the sweeter they’ll be! Dark, over-ripened bananas are perfect for baking into cakes, muffins, quick loafs, pancakes, or smoothies. Frozen bananas make milkshakes and smoothies extra creamy. Try adding them in your next morning smoothie. It’s a great way to add another serving of fruit into your daily food intake. Break a bunch of bananas apart to have them ripen slower. Store bananas out of sunlight but in a warm place if you want them to ripen faster. You can make banana ice cream by freezing banana chunks, blending them in a high speed blender. You’ll have sweet, creamy soft serve ice cream, that’s made just out of bananas! It’s a guilt-free treat that’s great for both kids and adults, alike. Bananas are great for breakfast because of their potassium and fibre. They’ll keep you feeling full yet delivering energy and electrolytes to kick start your day. Peel bananas from the bottom instead of from the stem so you can enjoy your fruit without bruising the end. To keep cut banana from browning, lightly spritz some type of citrus juice on top, such as orange, grapefruit, lemon or lime. The acid from the citrus will help slow down the oxidizing process that turns cut fruit brown. 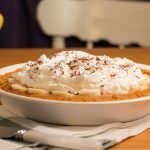 There are so many things you can do with bananas! Eating them whole for breakfast or as a snack is always a great option, but you can slice them on top of toast with jam, peanut butter or hazelnut-chocolate spread. 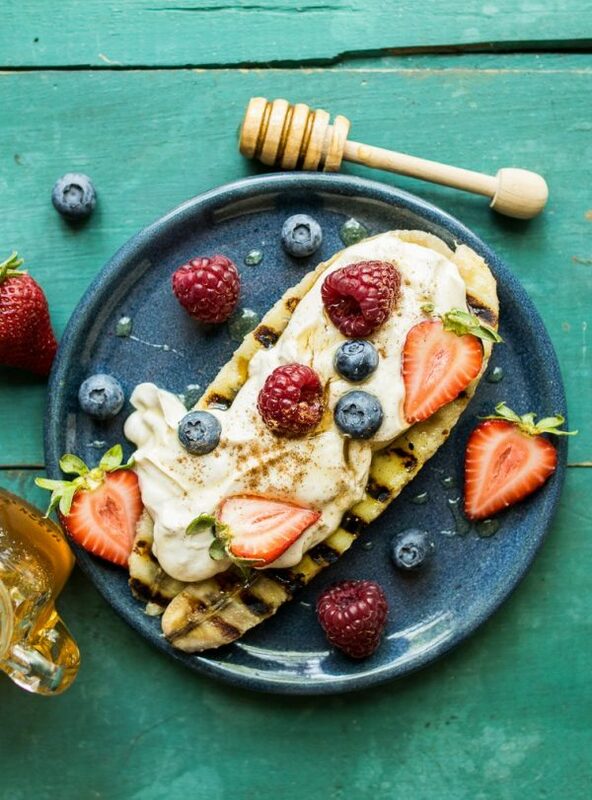 Bananas make a great addition to pancakes and crepes. 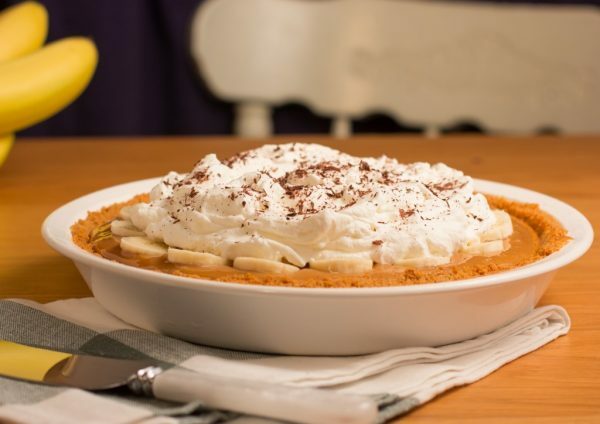 Bananas are also great for making into soft-serve “ice cream” when frozen and blended, or garnishing cakes or pies. According to the Canadian Nutrient File, one medium banana has, of your daily required intake, 15% of Vitamin C, 11% of magnesium, 10% of potassium, 9% of folate, 7% of fibre (1.7g), and 22 µm of the antioxidants lutein and zeaxanthin.